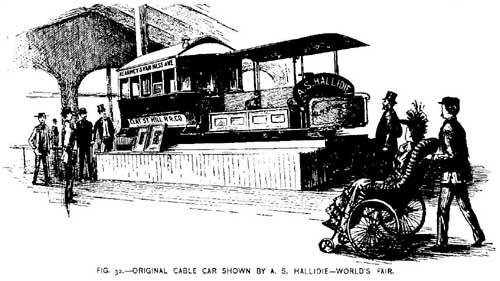 The exhibit of greatest popular interest in the street railway department of the Transportation annex is that of A. S. Hallidie, of San Francisco, the inventor of the cable railway. The exhibit shows the first grip car and trailer operated by him in San Francisco, August 1, 1873. A section of the conduit used at that time is also shown. The grip car is twelve feet in length with side and front seats, with accommodations for sixteen passengers. The space for the gripman is in the center of the car between the side seats. The car is equipped with the type of grip used in the original car and invented by Mr. Hallidie. Its appearance and mode of its operation can be seen by referring to Fig. 30. The lower of the two operation wheels raises of lowers the jaws to the height of the ropes, while the upper is used for causing them to grip the cable. Fig. 29 shows the first type of grip invented by Mr. Hallidie, but never used. It is similar to that shown in Fig. 30, a rack and pinion being used instead of the lower wheel. The car is equipped with a lever wheel brake and a track brake. The latter is operated by foot power. The trailer is a twelve foot body with dark red panels. The lettering shows that it was operated on the Kearney and Van Ness Avenue line of the Clay Street Hill Railroad Company. What is particularly noticeable in these days of ponderous street railway construction is the almost flimsy character of rails and conduit work. The track, which is shown in the exhibit, is a three inch T rail weighing about thirty pounds to the yard. The rails are spiked to stringers and supported at the joints by fishplates. The yokes form a conduit 16 x 12 1/2 ins., and are spaced every four feet. The conduit was made of boards between the yokes. The cable ran in the tube of the conduit, the opening for the grip, however, being slightly away from the middle line. The slot was formed by stringers, on the top of which were nailed two inch straps of iron. Instead of pavement of any kind, two inch plank covered the space between the slot rails and the track. The exhibit is loan by the Ferries & Cliff House Railway Company of San Francisco. 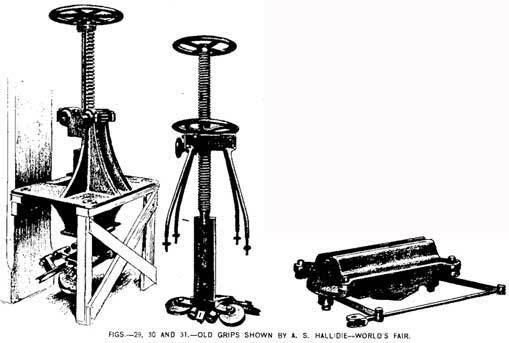 In connection with this exhibit of Mr. Halldie, and illustrating the progress made in cable work, a collection of cable grips in use in different cities is shown. The types used by the following roads are shown: Sutter Street Railway, San Francisco; Hoboken, N.J., shown in Fig. 31; Ferris & Cliff House Railway, San Francisco; Pacific Railway, Los Angeles; Kansas City Cable Railway; California Street Railway Company, San Francisco; North Chicago Street Railroad; Olive Street Railroad, St. Louis Railway Company; Citizens' Railway, St. Louis; Mt. Adams & Eden Park, Cincinnati; Wood & Fowler types are used in Los Angeles; Denver Tramway Company, Lane type. Directly back of the Hallidie exhibit at the west end of the street railway department, is the space occupied by the California Wire Works. A fine exhibit of wire ropes and cables is made, and a representation is made of an elevated ropeway.